OneDesk allows you to plan and keep track of releases and sub-projects with confidence, and ensure no information gets lost. Create subspaces to organize products, target releases, projects, and teams. This makes it easy to assign requirements, ideas, issues, and features to products and releases. It also allows internal and external team members to collaborate on specific releases and projects. • Go to the projects view (1). • Simply drag the sharespace to its desired position (2). Your projects will now be structured as you placed them. Plan out release scope based on available man-hours, resources and time. A few weeks ago, I wrote about how to use OneDesk’s product roadmapping tool. The product roadmapping capabilities allow you to see all the information in several projects in one view and makes the product release process more organized. This helps you stay on top of scope creep and schedule overruns. 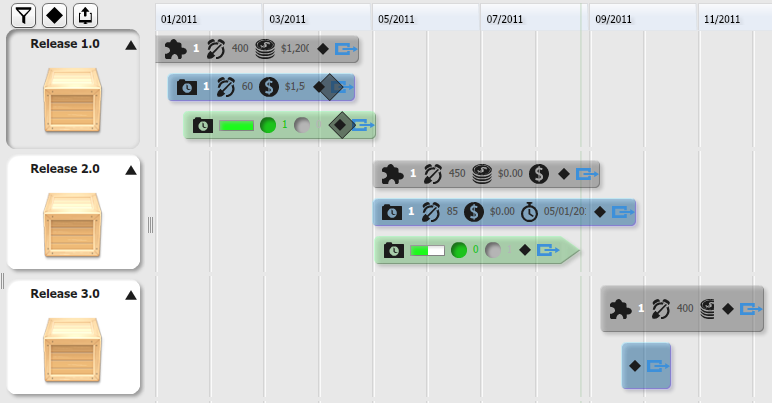 Simply hover your mouse over any bar in your roadmap. You will be able to see where the project is at based on percent complete, budget and schedule. You can migrate incomplete requirements to future releases by creating a sharespace for that release and simply moving your requirement to that sharespace. Go to the projects view (1). Select the sharespace the requirement you wish to move is in. Go to the requirements view within the sharespace (2). Go to the manage requirements or the requirements anlysis views (3). Select the requirement you wish to move (4). Go to the properties view (5). Click the drop-down arrow next to sharespace, and select the sharespace you wish to move the requirement to (6). The requirement will then be moved the sharespace you selected.